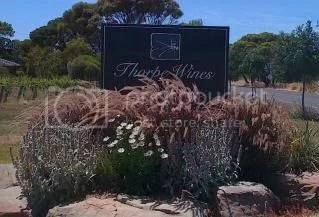 Thorpe Wines is a small vineyard holding of 17 acres under vine with Cabernet Sauvignon, Shiraz and an acre of Nero d’Avola on the corner of California Road and Malpas Roads on the McLaren Vale Plains area of McLaren Vale. Brad Hickey joined the company in 2007 and changed direct of the vineyard and winemaking for the 2008 vintage. To date the direct change has been focused on vineyard quality to produce “A” grade fruit which of course should lead to making the best quality wine. Tim Geddes who is a contract winemaker who has his own winery in McLaren Vale. During this time little marketing or direct selling has been attempted. Brad has been able to use his American contacts to sell wine into the American market. In Australia they sell wine through an internet and retail outlet sales Melbourne based business and has zero exposure in Adelaide. They produced about 4,00 cases of wine in 2008 and 2010 with half that produced in the difficult vintage of 2009. I get the impression that now there is a new vineyard standard showing the the wines being produced that work is about to start to promote these wines into the restaurant and retail trades. Check out my video tasting of some Thorpe Wines. Grapes from a vineyard in McLaren Flat (near Hoffmanns) are used to make this wine. It has undergone malolactic fermentation and had about a year in 2 year old french oak. There has been a minimalistic approach to the wine with Brad (the Managing Director) “looking” after the wine. The aromas are melons and peach – so far the wine is as what you would expect from a wooded chardy that has gone through malolactic fermentation. The surprise is in the flavors! There is a real lemon zest and nutty flavors with this real minerallity / acid finish – definitely a surprise. The minerallity and acid finish makes this a good food wine. I would suggest a chicken poached in a creamy sauce (with a splash of port or liquor muscat) as the acid would cut through the cream fats. Made by a different winemaking and viticulture team that is in place today. The grapes come from the 20 rows of the estate Cabernet. The nose has early gray tea with cedar notes from the oak and licorice on the end – an underlying complexity here. The flavors are what I would call secondary – ie little fruit now showing but a real mixture of cedar, chocolate and tea. I would like to drink this with complex spicy and some sweet notes of a Moroccan Tagine goat curry. Not enough Cabernet was produced in 2008 to make 2 wines, and the quality was such to be considered to meet the “Reserve” profile. There are sweet fruit notes of raspberries and blueberries combined with a soil character that was described by Thorpe Wine’s Managing Director as an Iodine, which after the comment then I could understand that was the soil character component I could smell. The flavors continued with Raspberries and Blueberries with a wonderful hint of Rosemary and cedar /fine tannin finish. The characters were across the whole palate so I did not get any lack of flavor in the mid palate that can sometimes be evident with Cabernet Sauvignon. The complexity of the wine particularly the Rosemary would mean that a game meat like Slow Cooked Kangaroo Tail braised with root vegetables. There was about 30 – 35 tonne of grapes used to make this wine and was picked before the heat wave of that year. The picking date was based on flavor profiles and not based on the impact of the heat wave. The aromas were the usual plum and berry character plus the same iodine background that I found in the Cabernet from the same vintage. The flavors hit me with citrus notes combined with plums plus the spice character of nutmeg and star anise (not the normally associated pepper flavors of Shiraz). The finish was savory but not overly tannic (the wine spent 1 year on 2 year old oak). There was an overall delicious factor that stuck me as definitely providing value for $15 price tag. When tasting this wine I thought of charred (BBQ) meats – maybe a good burger with lots of onion, cheese, lettuce, tomato and beetroot smothered in tomato sauce. There is a fundamental understanding of the Shiraz vineyard that the winemaker now targets certain “blocks” as the source for the Reserve Shiraz. The wine spends about 18 months in oak. When tasted the wine had been bottled for about a month and there were only 60 cases left for sale. The aromas had the usual plum/berry character but there was a complexity here with hints of thyme, white pepper and the floral note of Geranium flowers. The typically plumy/berry flavors were complimented with citrus, white pepper and star anise and again soft tannins. The tannins were more obvious than the previous wine but were still soft and not out of place. There is a structure here that I was not expecting from a $25 wine – so again a wine that over delivers at the price point. This structure would see this wine still drinking well in 10 years but I am not sure much will last that long.I was discussing food and wine matches with a friend and she told me about a dish she makes – Kangaroo Stoganoff that includes a decent amount of freshly ground pepper to offset any “gamey-ness” of the meat. Thanks Megan for the inspiration for a wonderful match for this wine. Now this was something I was looking forward to – a bottle fermented Shiraz that I had heard that was one of the better Sparkling Shiraz wines. The wine was disgorged in 2009 at a separate sparkling wine facility in Victoria (Kilchurn Wines). I was not disappointed! Straight away you can notice a fine bead (bubbles) that lasted as long as I had wine in my glass. The aromas had the fruitiness of Raspberry combined with the earthy and mushrooms. The Raspberry and Plums combines with the Star Anise spiciness that leads into a lengthy mouthful. There is a specific direction to make this wine in a dryer style so there is not a large volume of liquor added to the wine at disgorgement. I believe I will be consuming a number of bottles of this wine. I could be boring and recommend roast turkey with cranberry sauce to eat with this wine – but I am excited about this wine so I want to recommend something different. So on this basis I would like to try a warm shredded poached chicken and rocket salad with a Vin Cotta and Verjuice reduction dressing with this wine on a lovely summers day. Thanks to Brad from Thorpe Wines for supplying the photos used in this post. 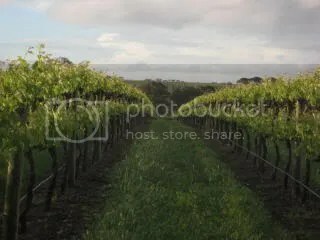 This entry was posted in Mclaren Vale, wine and tagged Cabernet, Cabernet Sauvignon, Chardonnay, Mclaren Vale, McLaren Vale Wine, Shiraz, Small Producer, wine, wine McLaren Vale. Bookmark the permalink.